An unusual event happened a few days ago in my life: My college daughter, Samantha, and I actually had a sit down meal and conversation. It wistfully reminded me of simpler times from long ago, when the whole family gathered around the dinner table every night. Alas, kids grow up, the world gets complicated, and things change. What once was a daily occurrence never seems to happen any more, so I relished the opportunity. As we chatted about nursing school and goofy pets, the radio broadcast of a baseball playoff game was heard in the background, gently steering our discussion toward baseball and sports in general. Samantha asked me what is the highest level of success an athlete could reach. Although it was only my opinion, I replied that competing in the Olympics was the greatest honor any athlete could ever hope to attain. She asked me to explain my viewpoint, and so, using LeBron James as an example (knowing that as an in-tune Millenial, she would instantly recognize the name), that even as one of the NBA's upper tier players, he volunteered to suit up for the Olympics in 2004, 2008, and 2012. Bingo! Point made and accepted. I went on to explain that professional athletes (defined as someone who accepts money for performing a sport), weren't always allowed in the Olympics. This gave countries behind the former Iron Curtain an edge in Olympic competition. Since their communist societies didn't have professional sports leagues, they were permitted to send their finest athletes. In places like the United States, the best team sport players were already participating at the professional level (e.g. NBA, NHL) and were not eligible to compete. Instead, their places were often taken by amateur college players. This changed in 1986, when the International Olympic Committee (IOC) opened up the games to professionals as well. As we were finishing dinner, I asked Samantha if she knew the story of Jim Thorpe. "Huh? ", as she stared blankly. 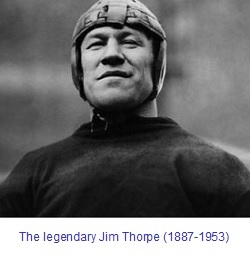 When I was in school, Jim Thorpe was mentioned in just about every history book. These days, I suppose the educational establishment prefers to use the page space to promote some left wing political agenda, so it was no surprise she didn't know who Jim Thorpe was. One of my few talents is that I can describe episodes from history in storybook fashion, at least well enough to capture and maintain interest. As my audience of one listened receptively, I explained that Jim Thorpe was a Native American from Oklahoma, our neighboring state to the south. Born in very modest surroundings in 1887, Thorpe faced many difficulties growing up, and was orphaned by the age of 17. It was during his high school years that the public began to take note of Thorpe's extraordinary athletic abilities. He excelled at every sport he tried: baseball, basketball, football, track & field... even ballroom dancing! While playing for tiny Carlisle Indian Industrial School in Pennsylvania, Thorpe led his team to the 1912 national collegiate championship by scoring 25 touchdowns, and was named to the All-American team. It was Thorpe's performance at the 1912 Olympics at Stockholm, Sweden, for which perhaps he is best remembered, winning the gold medal in the pentathlon and decathlon events. In 1913, it was discovered Thorpe had received a small amount of pay in 1909-10 for playing semi-pro baseball. The IOC ruled him as a professional, not an amateur, and stripped him of his gold medals, declaring runners-up Fernando Bie of Norway (pentathlon) and Hugo Wieslander of Sweden (decathlon) as the winners. Neither athlete wanted the gold, saying the only true deserving champion was Thorpe. Thorpe went on to play major league baseball and was one of the NFL's earliest star players. He retired from sports in 1928 at the age of 41 and passed away in 1953, just shy of his 65th birthday. From the time of his retirement onward, Thorpe's legacy and place in history began to grow. 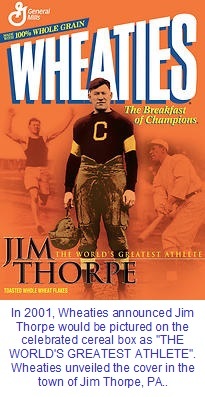 In 1950, the Associated Press polled hundreds of sportswriters and broadcasters who chose Thorpe as the Greatest Athlete of the First Half of the 20th Century. In 1963, he was elected to the NFL Hall of Fame. In 1999, the AP placed him third on the list of the top athletes of the century, behind only Babe Ruth and Michael Jordan. A short time later, in a poll of sports fans sponsored by ABC, Thorpe was voted the Greatest Athlete of the 20th Century (I don't know about you, but I get choked up thinking about that). In 1982, Thorpe's supporters, with the backing of the U.S. Congress, demonstrated the IOC had broken its own rules by disqualifying Thorpe after the 30-day time window for challenges had closed. Eventually, the IOC agreed it had erred in 1913 and declared Thorpe as co-champions with Bie and Wieslander. In a ceremony held on January 18, 1983, the IOC "returned" the medals to Thorpe's family (the original medals from 1912 were stolen from a museum). Justice finally prevailed, though 70 years late. The very next day, I finally got around to reading my Oct 26, 2015 edition of Coin World* magazine, doing a double take upon reaching page five. Recall, just the evening before, I heralded the Jim Thorpe saga to my daughter. 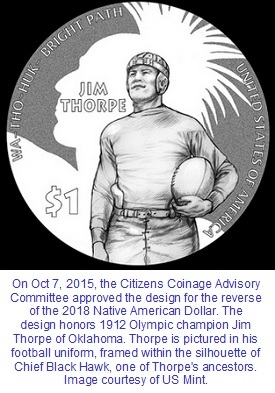 In a remarkable coincidence, Coin World was reporting on the approved design for the 2018 Native American Dollar featuring... you guessed it, Jim Thorpe. Samantha was in the next room, so I called her into my office. With the lesson still fresh from the evening before, she immediately understood why a coin commemorating Jim Thorpe would be a worthy theme. I, too, felt a bit of personal satisfaction, because this time, there was backup evidence showing good ole dad knew what he was talking about. Also made me look wise and prophetic (that's PROPHETIC, not pathetic, LOL). Thanks, Jim! The Thorpe design will display on the reverse of the Sacagawea Dollar. Every year since 2009, the Native American Dollar has carried the Sacagawea obverse, with a new reverse every year. In 2018, it will be Jim Thorpe's turn. What a fitting tribute for one of our greatest Americans.